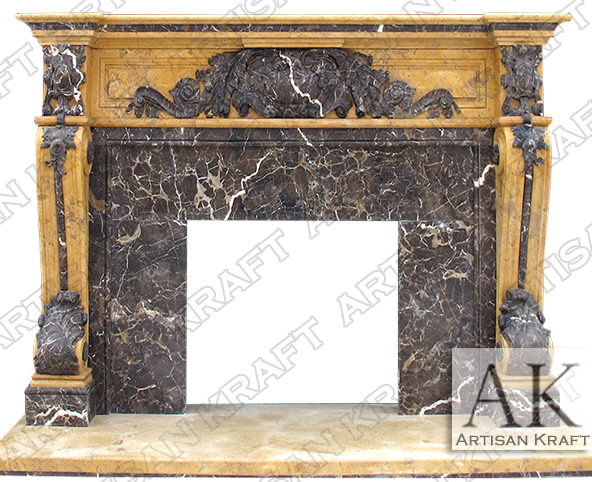 Finely hand-carved French marble fireplace mantel that is accented by cream throughout making the Verona Regal an ornate design worthy of a lavish home. This beautifully crafted by hand by expert craftsmen. Two different colors are used to make it stand out. Leaves and scrolls are carved throughout. The brownish stone has white veining running throughout. This surround can be custom fited to your particular dimensions. We deliver accros the US including New York, New Jersey and Texas. Providing installation per project. Typical Dimensions: 75″ wide x 54″ high *can be made to custom dimensions. Stone: Brown marble, limestone, sandstone. Available in many different colors, textures and finishes.